Many of these problems are easy to diagnose and some are easy to repair on your own. For more serious repairs or anything you are unsure of, consult with a professional microwave repair company. If the touchpad on your microwave isn’t working, there could be a couple of things going on. First, make sure the touchpad is clean of all grease and grime. If that doesn’t work, there may be a problem with the control board or membrane switch. A noisy microwave can mean many things. If the noise is coming from the turntable, it may be a problem with the drive motor. If it’s making a grinding noise, the motor should be replaced. Another part that could be causing the noise is the magnetron. This could be making a loud humming or buzzing noise. The other potential cause of loud humming is the high voltage diode. Both of these pieces can be replaced easily. If your turntable doesn’t turn, this could be a problem with the drive motor, the roller guide, or the coupler. You may need to remove the floor of your microwave to inspect the drive motor. Look for cracks and other signs of wear or damage. 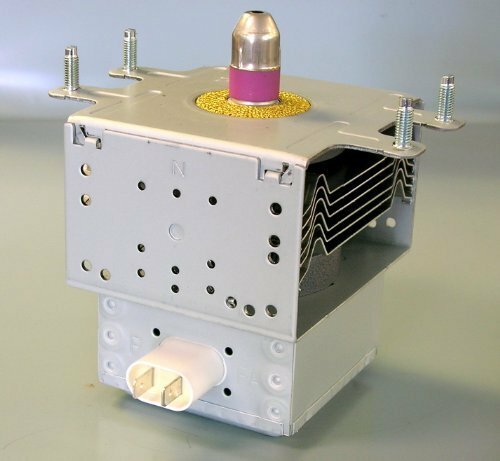 If your microwave is not properly heating, you need to check out the high voltage diode, and as previously mentioned, it can be easily replaced if this is the cause. The door switch and magnetron should also be inspected for damage or wear and tear. If the microwave does not shut off when the time runs out, this could be a problem with the door interior switch or smart board. Check the thermal and ceramic fuses if your microwave won’t turn on. The exhaust fan not working in your microwave? This could be as simple as needing a new charcoal or grease filter. If the door is stuck closed, you need to inspect the door latch level or button. The latch assembly can be easily replaced in just a few minutes. If your microwave is sparking while in use, you need to shut it off and unplug it immediately. It could be the high voltage diode or stirrer assembly that needs to be inspected and replaced.